Calling all teachers, workplaces and youth leaders! Think back to when you were a kid…what were your favourite learning moments? Was it when you mastered the skills to shoot a basketball into a hoop? Or helped your parents cook dinner? Or perhaps embarking on a hike to learn about nature? Some of my favourite learning moments as a child were when I was able to observe or participate in an activity. For example, one teacher led our class in a pedometer challenge to learn about math and distances, while simultaneously helping us understand the benefits of physical activity. Those hands-on experiences became more personal and meaningful, and helped to shape my confidence, and future perceptions and behaviours. At Public Health we strive to build people’s knowledge, attitudes and skills so that making healthy decisions is easier. But how do we make learning about health exciting? How do we make it meaningful and empowering? To do these things, we’ve launched a new initiative in partnership with local public libraries. You can now borrow a collection of resource kits and DVDs to learn about health topics in a fun, hands-on and engaging way. Want to challenge your colleagues to be more physically active? Borrow a set of pedometers! Looking to teach your Girl Guides or Boy Scouts group about proper handwashing? Borrow our GlitterBug Hand Washing Kit! 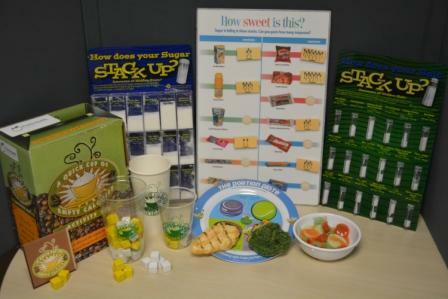 Looking for creative ways to teach students about fat, sodium and sugar intake? Borrow our display boards and game sets! This new collection includes DVDs and interactive kits for a variety of health topics: physical activity, healthy eating, personal safety, tobacco and alcohol and human development. You can find the full list of topics and resources on our website. These resources can be used by many groups for many purposes, from the classroom, to a workplace wellness event; for health fairs or for youth events. They also align with the 2015 Health and Physical Education (H&PE) curriculum for teachers. Where can you get your hands on these fantastic resources you ask? Visit one of these libraries or check out their online catalogues to request one of these kits or DVDs. If you have any questions about these resources please call us at 1-800-265-7293 ext. 4111 or email schoolhealth@wdgpublichealth.ca.